Sea Launch's mobile Odyssey launch platform has departed the company's Southern California home port bound for the equatorial Pacific Ocean for liftoff of the Eutelsat 3B communications satellite in late May, officials said Monday. The ocean-going platform left Sea Launch home port in Long Beach, Calif., at about 10:30 a.m. PDT (1:30 p.m. EDT; 1730 GMT) Sunday, according to a Sea Launch spokesperson. It takes nearly two weeks to transit from Long Beach to the launch position along the equator at 154 degrees west longitude about 1,400 miles south of Hawaii. The Eutelsat 3B spacecraft, fueled and encapsulated inside the payload fairing of Sea Launch's Zenit 3SL rocket, will provide broadband, multimedia and television services over Latin America, Europe, Africa, the Middle East and Central Asia. The satellite is owned by Paris-based Eutelsat and is designed on the Eurostar E3000 platform manufactured by Airbus Defence and Space. 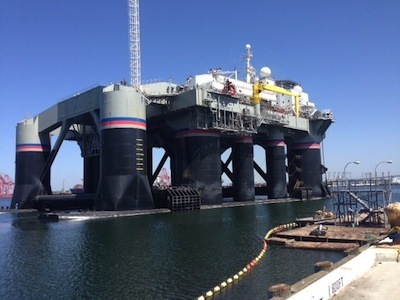 The Odyssey platform -- a converted North Sea oil drilling rig -- is due to arrive at the launch site in time to begin the Zenit rocket's 72-hour countdown. Liftoff is set for May 26 at 5:10 p.m. EDT (2:10 p.m. PDT; 2110 GMT). The bulk of the launch team will leave Long Beach this week aboard the Sea Launch Commander, which doubles as the company's rocket assembly hangar and control center. 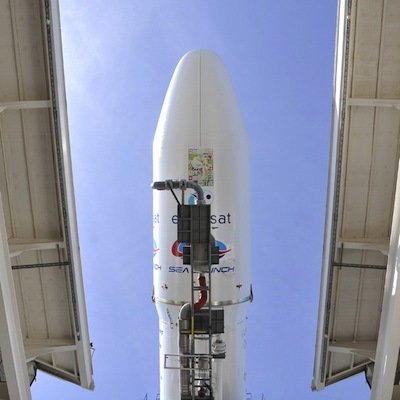 The flight with Eutelsat 3B will mark Sea Launch's 36th mission since 1999. It will be Sea Launch's first mission since a launch failure seconds after liftoff in February 2013 destroyed a Zenit 3SL rocket and the Intelsat 27 communications satellite. The Zenit rocket's return-to-flight mission was in August 2013 with an Israeli communications satellite in a launch from the Baikonur Cosmodrome in Kazakhstan. Sea Launch puts large commercial telecommunications satellites in orbit using Zenit 3SL rockets comprised of Ukrainian-built first and second stages and a Russian Block DM-SL upper stage provided by RSC Energia. Nyon, Switzerland-based Sea Launch is 95 percent owned by a subsidiary of Energia. The launch of Eutelsat 3B was delayed from April 15 after a rocket component was damaged during preflight testing at the Long Beach home port. The error occurred during a "dry rollout" of the rocket, in which technicians hoist the Zenit booster atop the Odyssey platform's launch mount before heading to the launch site. The error caused mechanical damage to the lateral plate on the Zenit rocket's interstage truss, which connects the first and second stages of the Ukrainian part of the launcher, according to a Sea Launch statement. Workers repaired the damage and conducted a second dry rollout test May 9 before Odyssey's departure from Long Beach. The Sea Launch Zenit 3SL rocket will deploy the 13,155-pound Eutelsat 3B satellite into a geostationary transfer orbit with an apogee, or high point, of 22,143 miles and a perigee, or low point, of 239 miles. The orbit will be aligned over the equator, an advantage of Sea Launch's launch site at 0 degrees latitude, reducing the fuel required to boost the spacecraft into its operational perch 22,300 miles above the intersection of the equator and 3 degrees east longitude.